5 ACRE SLICE OF PARADISE!...with custom home + studio! Main level of home features vaulted wood ceilings, clerestory windows, spacious living room with dining area, kitchen , master bedroom, full bath and laundry room. The upper level features 2 bedrooms and a 3/4 bath. The home features a lodge feel with paneled walls, exposed beam ceilings and picturesque views from every window. A staircase from the kitchen leads to the workshop and garage on the ground level. Adjacent to the home is a separate studio updated with flooring and a free standing wood stove. The studio has a kitchenette and 3/4 bath offering numerous possibilities. The property features a well plus city water. You'll discover plenty of useable land and fenced pastures, ideal for equestrian use. 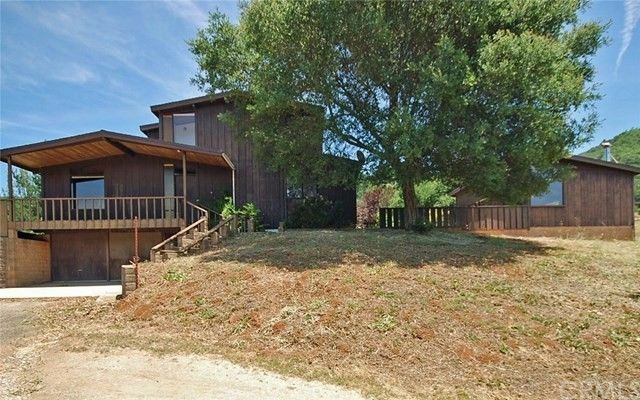 The superb location midway between Atascadero and Morro Bay offers a desirable micro climate with the coastal influence. Gorgeous setting!! First time on the market, hurry! View VIRTUAL TOUR with more photos and information! Directions: Follow Hwy 41 West to Old Morro Road West. Turn left. Turn left on San Miguel to access driveway on left side of parcel. Corner parcel-Old Morro Rd and San Miguel Rd.